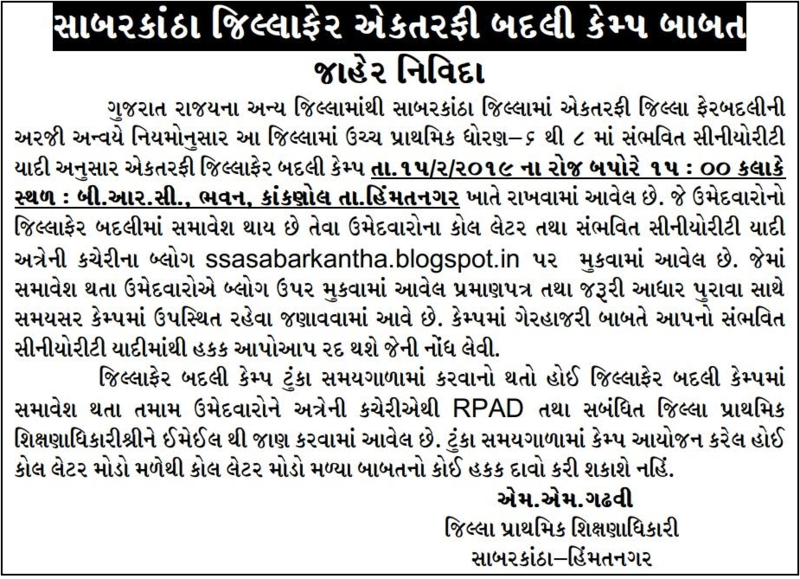 Primary and Upper Primary Teachers are looking for Sabarkantha Jillafer Seniority and Badli list. Here on this page all information available for Sabarkantha Jillafer Camp Date, Jillafer Seniority List and other information. Sabarkantha District is bounded by Rajasthan state to the north and northeast, Banaskantha district and Mehsana district to the west, Gandhinagar District to the south and Aravalli District to the South – East. The administrative headquarters of the district is Himatnagar, about 80 km from Ahmedabad, and talukas Prantij and Talod are major industrial locations in Sabarkantha. District has a population of 14,73,673 as per last census 2011. District is divid in 4 Revenue Sub-Divisions & 8 Talukas. There are 6 Municipalities in the District. Poshina, Khedbrahma & Vijaynagar Talukas are mainly tribal Talukas. These Talukas are hilly and forest areas. Remaining Talukas are mainly flat areas. Patel’s & Darbar’s are major groups of communities in the district. However Dungari garasiya is the dominant community among tribal’s. Punsari, a small village in the district select as the best village in Gujarat.